W3Techs content system management report suggests that the leading top three CMS’s are accountable for more than 70% of total CMS usage across all websites on the web. You can learn more about the other types of content management systems out there using this site. This roundup of the leading content management systems focuses on both the leading platforms, but also specific niche ones in markets such as eCommerce. Startups, eCommerce business owners, creative artists, writers, and many others who come from similar fields have realized that you don’t have to invest tens of thousands of dollars into your own personal content platform, and instead it’s possible to rely on what is already out there, fully established and support by community of millions. The following list of the most popular content management systems has been gathered thanks to data from some of the leading analytics platforms on the web, and we have made sure that there is enough variety so that anyone and everyone can find a solution to their particular idea. A household name in content management system market, WordPress is the ultimate publishing platform for the web. Sites of all sizes rely on WordPress to help publish, manage and organize content of wide variety; articles, tutorials, photos, videos, stories, and much more. WordPress is not only easy to learn, but also highly flexible towards beginners and experienced users alike. The public plugin repository has an estimated 40,000+ free plugins available for download, while the public WordPress theme database has over 2,100+ styles to choose from. WordPress has become the standard for a website that’s both functional and pleasant to browse. Startups and mobile applications have long transferred to WordPress for their website needs, not only because of the wide variety of styles available and the ease of design flexibility, but because WordPress is secure, reliable and pleasant to work with. WordPress users have the option to built a site of any context; eCommerce, business, creative, community, non-profit, and so forth. Joomla! is for those who are looking for a little bit of a challenge, at least in terms of coding power. In many ways, Joomla! has been built with medium to large sized sites in mind. Joomla’s! code base is much more sophisticated than that of WordPress, but it comes at the benefit of more scalability and more back-end integration. Many of the people that I know who are using Joomla! are quite fond of features like native front-end content editing, content management flexibility, and a native integration of multiple languages which makes the sites content more friendly towards visitors of foreign nature. Drupal goes even deeper into the architecture of the content management system itself, and because of how widely adapted it is to professional coding standards, a lot of engineer and developer-type webmasters have adapted to Drupal as their primary content management platform. Drupal offers more than 30,000+ extendable modules to bring your site to a whole new level, as well as 2,000+ individual and unique themes that will help to build the site that you’ve always wanted to build. Thousands of members participate in daily forum discussions, meaning that finding support for Drupal is really not a problem, rather a question of whether you really need help or are there resources available that can solve your problem without having to visit the community forums. eCommerce is a market in itself, and it’s important that we realize that for some of our eCommerce tasks, perhaps the best choice is to opt for an independent eCommerce platform altogether, and one such platform is Magento. Whether you’re looking for a small business solution in an environment where nobody really understands technology, or you’re working from a corporation that needs a professional enterprise eCommerce solution — Magento is likely to be a choice that won’t disappoint you in either way. Companies like Nike, Gant, and Cort are just some of the people on the client list of Magento’s eCommerce platform. Blogger has evolved drastically over the years, and while it keeps its legacy towards being a blogging platform, it has been used as a content management system in more ways than one. In recent years, a lot more flexibility was introduced in the way Blogger sites can be styled, which means that photographers, foodies and creatives have a lot more room for building a content platform that suits their needs. Blogger is part of Google, and offers a range of features like custom domains, custom styles, and customization options. 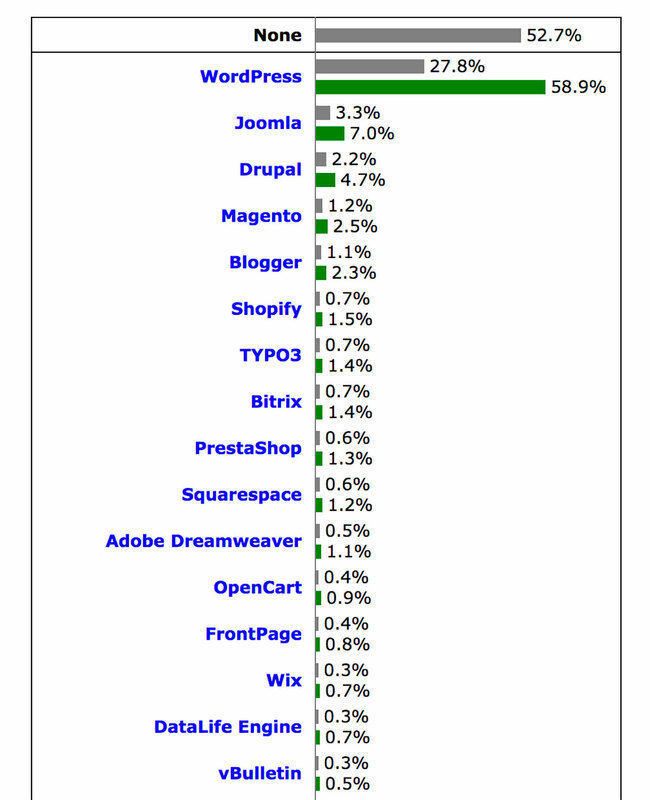 The biggest argument about TYPO3 versus other content management systems is that TYPO3 has been built exclusively to serve sites of a much larger magnitude, as well as to be a native content management platform, whereas platforms such as WordPress are traditionally considered to be native blogging platforms. TYPO3 is popular amongst corporate websites, largely thanks to its integration of features that would otherwise require extensions or plugins, which we all know slow down the site and overall site performance. YPO3 is credited to be highly flexible. It can be extended by new functions without writing any program code. Shopify is another eCommerce platform that is more focused on helping freelancers, small businesses, but also corporation size businesses that need reliable and secure eCommerce platform services. Shopify has been around for long enough to earn respect in the community as one of the leading eCommerce content management platforms, and is home to some several million community members who actively use Shopify to sell, buy and trade products. Shopify works beautifully with any type of device, making it very appealing to those who don’t have a huge budget to shell out on custom designs, and besides — Shopify offers a range of designs, all of which can be fully optimized by yourself. vBulletin used to be just a forum platform, whereas in the recent couple of years a switch happened from traditional forum community services to a more content management oriented platform that still involves a lot of community involvement through native forum functions. Those who wish to build a community around their content should look at vBulletin as one of the top choices, not only because of how secure it can be, but also because the team behind this platform have over a decade of experience with building platforms that support some of the largest communities in the world. vBulletin is the perfect content platform solution for those webmasters who want to create a lot of content with the help of community. Liferay is a fairly new player in the CMS game, but is already home to some 1,500+ customers who enjoy building unique websites, customer portals, membership sites, and content resources for needs of any variety. Liferay’s modern approach to design and technology has enabled them to attract the kind of audience that wants to build professional and good looking sites with the help of latest advancements in content technology.